This proposal would most likely pack a punch and raise expected nominal income growth. It would also once and for all settle the debate on the efficacy of monetary policy at the zero bound. There is no doubt in my mind what the outcome would be. A big problem, though, with implementing so much monetary firepower is the absence of a well defined policy goal. Currently, the Fed has a vague policy goal of improved labor market conditions in a context of price stability. No one really knows what that means. Scott would like to change that by having the Fed target the NGDP forecast using NGDP futures contracts. This is a great idea as it would put monetary policy on autopilot, increase transparency, and respond to money demand shocks. But the Fed is along way from adopting such a goal. Here is a suggestion for a less ambitious way for the Fed to target the forecast. First, the Fed would set a target for average nominal household income growth over the next year. 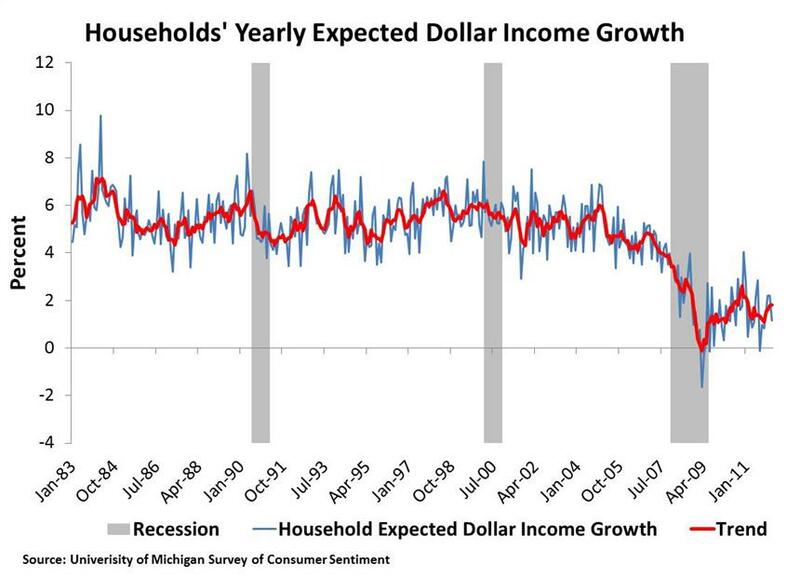 Second, the Fed would contract with multiple polling organizations to do a weekly poll where they ask households how much they expect their dollar incomes to grow over the next year. Third, the Fed would take some average of these polls and compare it to the Fed’s targeted growth rate for nominal household income. Fourth, the FOMC wold then conduct open market operations to bring household’s expected dollar income growth in line with the Fed’s target growth rate. If more immediate feedback was needed, the Fed could contract to have the polls done bi-weekly. This still wouldn’t give the instant feedback a NGDP futures contract would, but it would be straightforward to implement. The Thompson Reuters/University of Michigan Survey of Consumer Sentiment currently asks that question every month. So it should not be that hard for them and other polling firms like Gallup to ask the question weekly. Question: would this proposal be susceptible to the circularity critique? If so, what could be done to fix it? This post was originally published at Macro and Other Market Musings and is reproduced here with permission. One Response to "Target Household Income"